Plans to transform the neglected Bishop’s Park in Abergwili into a community jewel and put it firmly on the tourist map have taken another major step forward after the Tywi Gateway Trust received a £23,500 from a national grant-giving charity. The grant from Allchurches Trust will help towards funding a sensitive restoration of the under-used Bishop’s Park site, particularly the revitalisation of the walled kitchen garden and adjacent bothy, which is leased from the Church in Wales. The Walled Kitchen Garden will be available for both horticultural and community use, including providing therapeutic opportunities for people with disabilities and a base for garden volunteers. The new Tywi Gateway Centre will be a hub for the local community, boosting the local economy and making it a draw for tourists as the starting point for the Tywi Valley Path. Working with the local community, the Tywi Gateway Trust is seeking to reverse the years of decline, adding extensive visitor facilities by converting the former Bishop’s Palace larder, dairy and laundry in a semi-derelict wing of the County Museum, the former Palace of the Bishops of St Davids, into learning and interpretation spaces and a coffee shop. The restoration and conservation of the grounds, including the Pleasure Grounds, Great Meadow and Bishop’s Pond, are also part of the Trust’s plans, providing outdoor learning facilities, a place for relaxation and recreation and a thriving habitat for wildlife. 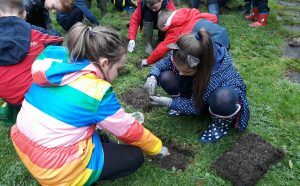 Local people have already been engaged in planning for the project, including children from Abergwili Primary School, who visited the site to plant daffodil bulbs and taste different varieties of apple growing in the walled kitchen garden orchard. Allchurches Trust is one of the UK’s largest grant-making charities and gave more than £16 million to churches, charities and communities in 2018. Its funds come from its ownership of Ecclesiastical Insurance Group.